Samuel Wharry, Harphall, Carnlough has been appointed chair of the AgriSearch sheep advisory committee in succession to upland farmer Ian Buchanan, Dungiven, who stepped down after the maximum permissible term of service. Well known as NI chair of the National Sheep Association Sam is a hill farmer much involved in breed improvement and lamb marketing initiatives. The new vice chair of the AgriSearch sheep advisory committee is lowland lamb producer Crosby Cleland from Saintfield. David Workman, left, vice chair AgriSearch Board of Trustees with the newly appointed chairman of the sheep advisory committee Sam Wharry centre and vice chairman Crosby Cleland. Welcoming them to their new volunteer roles David paid a warm tribute to the unstinting efforts of Ian Buchanan, past chair of the sheep advisory committee. The current advisory committee members are; Chair Sam Wharry, vice chair Crosby Cleland, Campbell Tweed, Isaac Crilly, David Wallace, Edward Adamson, Barry Brogan, Jonathan Birnie, Colin Smith, Seamus Maginn and Dr Raymond Steen. 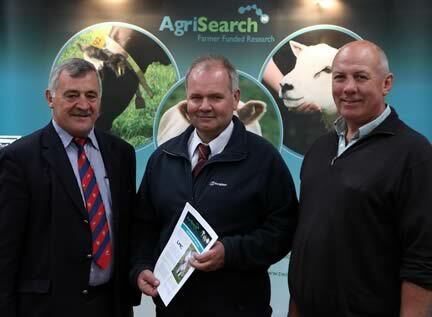 Farmer funded AgriSearch, the NI Agricultural Research and Development Council, supports production orientated research likely to be of value to lamb, beef and milk producers in the province.